Please support your community with a donation to SRNA – we are dependent on you to be successful! Questions or suggestions about development? Contact us. *** (May 2015) See MU-14 Update – option to purchase property by residents! *** (July 2014) MU-15 @ RM 620 & Steiner Ranch Blvd. continuing plans for multi-facet project including car-wash / retail/office or pad site. *** (December 2013) – McCormick Ranch is a 131 home development planned off of Selma Hughes Park Rd adjacent to Quinlan Park Rd and bordering Lake Austin. The new subdivision will be built as part of the Steiner Ranch development agreement with the city of Austin – this agreement authorizes a pre-set number of homes, impervious cover, green space, etc. within the Steiner peninsula for future development. The site was previously considered for more dense development and was available as a large ranch lot. The current plan includes four phases of development, with three of the phases, numbers 1,3,4 including large (>1acre) custom home sites – likely these will be comparable to “The Bluffs”. The second phase of development will include 84 homes and is under contract to be developed by Taylor Morrison pending approval at the city. Local residents from the “River Ridge” neighborhood appeared at a zoning and platting commission meeting in November and wrote in comments opposing the approval of the plan due to concerns about emergency egress, traffic and school crowding and gained an almost unprecedented vote of sympathy from the commission. The issue is back up for consideration December 17th at City Hall at 6pm. It is unclear if the commission technically has authority to deny an application that meets all city and county requirements and may likely turn into a legal issue. SRNA will attend the meeting in support of the residents and in keeping density and check. Updates will be posted afterward. *** (December 2013) – New storage facility to be built across RM 620 from Randalls. The storage facility will utilize half the lots in the 8+acre development site. SRNA is in the process of reviewing the plans for the facade of the building. The site is not part of the Hill Country Roadway ordinance because it is not in the City of Austin – that ordinance carries built-in standards for construction. *** December 2013: Developer updates incorporated per tract – Apartments behind former Welcome Center (MU-1B) are moving forward and have been approved. MU-13 apartments have been approved and are in per-construction planning with a new developer. Expecting construction to begin on both complexes in 2014. MU-11 is moving along and will open mid-2014. MU-14 is being targeted for development starting in mid-2014 – SRNA is still working on seeing an alternative despite developer plans. Growth has been significant in the Four Points and Lake Travis areas over the past decade is still going strong. For those of us that live and work here this generally can mean higher home values and revenues, and increased conveniences, but ensuring that growth is compatible with our community is critical to maintaining our quality of life. One of the principal motivations when SRNA was formed was to address concerns related to the significant amount of development remaining right here in our neighborhood boundary. A large portion of this growth will take place within the Steiner Ranch development and the SRNA is actively engaged with the developers and government officials toward the goal of compatible growth. Traffic – With traffic congestion already a reality (see ‘Traffic Issues’) the volume of cars added to the roadways by any development along with the type and timing of the traffic is of significant concern. In particular, residential traffic load adds directly to the work and school commuting traffic patterns are that are most problematic today. Schools – Our neighborhood has Exemplary schools which attract many new students each year. Significant new residential development puts added stress on the ability of the schools to handle all the students in our area. Emergency Services – For each new development, the ability of emergency services to handle the added development must be carefully considered, including the ability to safely access the property and considerations for evacuation. Is the development filling a need that is viable in the long term. Without long term viability, the community will suffer if a particular development will decline in value. An example is over-building of rental units if the long term market is unlikely to support the currently perceived short term demand. Are there any acute negative impacts that need to be avoided or mitigated for a particular development. Several of these have already been addressed by working constructively with developers (see below). Are the aesthetics of the development compatible with the area. The look and feel of a development and its location can have tremendous impacts on the surrounding areas. For example, aesthetics of development at the highly visible intersection of Quinlan Park Rd. and RM 630 will impact home values and the perception of the surrounding developments for everyone in the SRNA area. SRNA is currently focused on limiting the negative impacts of proposed residential developments within Steiner Ranch. A special focus is on concerns with the proposal of duplexes on MU-14 and finding a viable alternative use. 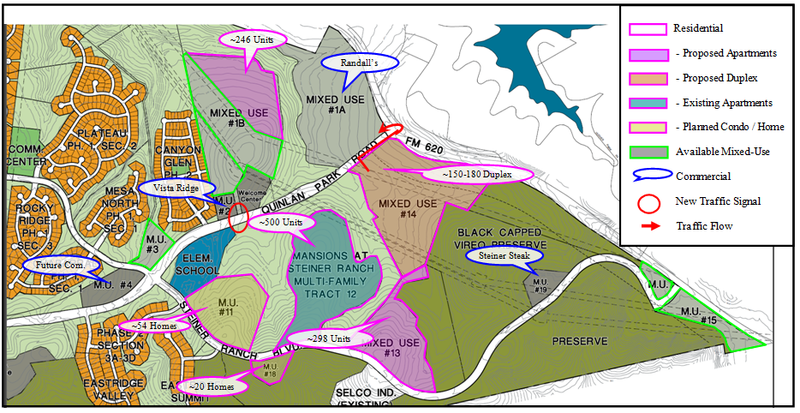 Map of development sites near the front of Steiner Ranch. See a summary by tract of future and on-going developments in our area. MU-14 sits at the SE corner of RM 620 and Quinlan Park Rd. This highly visible location serves as the front door to Steiner Ranch and is is prominent for immediately surrounding areas as well. The site is constrained due to topography with only one access road viable across from the Randall’s exit on Quinlan Park Rd. Due to the proximity to RM 620 and for other safety reasons, any access from this tract needs to be headed north on Quinlan Park Rd. headed toward RM 620 (see map). Taylor Morrison and KLP/Kucera Company – joint owners of this property – have been eying residential development on this tract with between 150 and 180 duplexes currently planned. The duplexes would generally have 3-4 bedrooms and the most recent plans call for two “blocks” of buildings to be clustered on the site. SRNA has opposed the development of MU-14 for residential purposes due to specific concerns detailed below and due to its the contribution to the aggregate impacts of all the newly planned residential development near the front of Steiner Ranch. The restrictions on traffic flow to and from MU-14 make it a poor match for residential development. Since traffic can only flow in the direction exiting Steiner Ranch it means that traffic bound for schools, parks or other destinations within the Steiner Ranch community will need to either do a U-turn at RM 620 after cutting across multiple lanes of traffic, or would need to go all the way around RM 620 to Steiner Ranch Blvd to return to the community (a multiple mile detour). Both of these options pose new and impractical traffic flows to already congested traffic on RM 620 (see ‘Traffic Issues‘). Given that the high relative student density in Steiner Ranch the traffic patterns for parents taking their kids to school will be major problem during rush-hour. The inconvenience and safety issues associated with any potential residents of MU-14 will have lasting impacts since the basic limitations will not change over time. This means that the property values are likely to decline over time – all the while with new traffic flows contributing to significant congestion and safety concerns. Travis County TNR reviewed the plans for MU-14 with the proposed duplexes and came to the same conclusion – mainly that the site is not a good fit for residential due to the traffic flow concerns. Further, the lack of more that one access point for more than 30 homes is restricted due to safety concerns and emergency access. A variance would need to be granted by the County to allow for duplexes to be developed. However, the developer’s other option is to create a separate entrance for additional expense. The developer has hired Armbrust and Brown LLP law firm to represent them in the process of seeking approval on this issue. The developer plans to start construction in mid-2014. School crowding is an additional concern with the proposed MU-14 residential development since they are planned for multiple bedroom configurations which will lead to a relatively high density of students – putting strain on the limited set of schools serving our area. Aesthetics are another important concern for the development of MU-14 due to its prominent and highly visible positioning in the area. It is highly visible due to its relatively lower height vs. the surrounding road-ways meaning clear cut blocks for development with entry level architectural plans may significantly detract from the front door look of the neighborhood and area. Due to all the aforementioned concerns and problems with residential use of MU-14, the SRNA is opposed to either duplexes or apartments at this location. 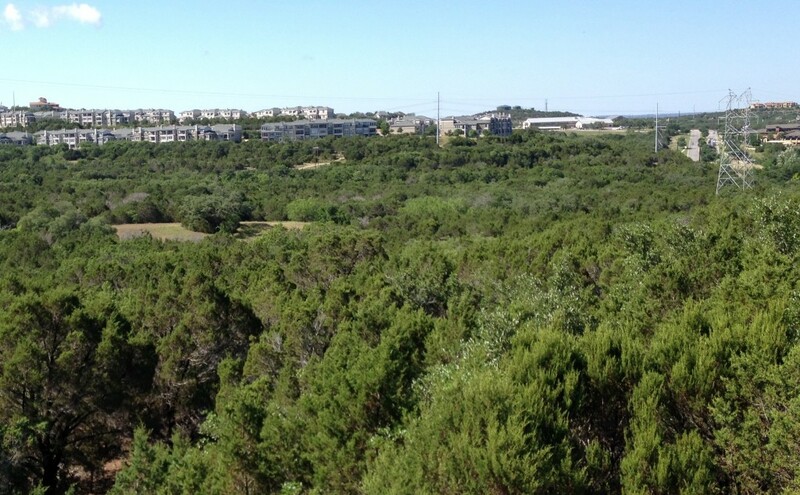 In May, 2012, SRNA was able to secure restrictions on a 10 acre subset of the 84 acre MU-14 tract which is zoned by the City of Austin – the restrictions limit this segment of the tract to 54 residential units maximum and preclude the development of multi-family units or apartments (but not duplexes) on the tract segment. Since a majority of the tract is not covered by the zoning restrictions, development of apartments on MU-14 is still conceptually possible on the un-zoned portion; however, the concerns and reasoning for opposing the development of duplexes apply to apartments as well. The total number of units planned is 180 and would be permitted by utilizing the unzoned area of the property. Taylor Morrison and Kucera/KLP Company have almost 10 acres of impervious cover credits attached to Mu-14. These are the motivation for developing the site as residential despite the concerns and objects raised by SRNA and Travis County. One previous concept was the development of a climate controlled storage facility at the location – but this was cancelled when the potential developers withdrew interest around the time that area residents expressed frustration with the concept. SRNA has been working on identifying other options that may be viable for this property. The most basic option available would be for Taylor Morrison and Kucera/KLP Company to keep the property on the market until another developer purchases the tract for development compatible with the existing community, such as low traffic volume commercial. SRNA has also explored many alternate uses for the MU-14 tract. The most viable option would be for the community to take ownership of the property via WCID 17 – Steiner Ranch defined area. WCID 17 would purchase the land by reducing the rate of pay-off of bonds. Taxes are already set to go down in the coming years and purchasing this land would still allow them to go down, but at a slightly slower rate, possible at a rate of 2 cents per hundred. This would not extend the payment period of the bonds. To pass such a measure would require a majority vote. The community would gain a valuable piece of land and would control its future use – e.g. could be used for park, etc. Also, the community would gain impervious cover credits which would allow for building significant additional amenities – something which is currently not possible in our community. Currently, the developer has not expressed an interest in pursuing this option. Other open concepts include the possibility of freeing up impervious cover credits to be utilized somewhere else. Please contact us if you have any other suggestions for use of MU-14. Previous concepts explored include a conservancy / nature preserve, a library (via library district formation), and use for ESD #6 or EMS. With at least three sites planed for development of rental units (MU-13, MU-1B, MU-14) and at least two additional home developments near the front of Steiner Ranch (MU-11, MU-8), others within Steiner Ranch, and McCormick Ranch at the southern end, there are over 1000 new residential units planned – an over 20% increase in total residences and a 250% increase in rental units – see map. This significant growth in residential density on the Steiner Ranch “peninsula” with have significant impacts to traffic, schools, and services. Plans for apartments have been approved at the city. Original developer pulled out and owner is now working with a new developer whose plans are under architectural review only – expecting construction to resume in 2014. Number of bedrooms per unit is as yet unknown with new developer. Lot (1): The northernmost lot (closest to 620) is the site for an apartment development that has now closed and is preparing for construction. Lot (2): The middle lot is a possible site for either commercial or residential development. Lot (3): The southernmost lot (above Canyon Glen) is likely to not be developed due to the terrain. Leaving this site undeveloped will be generally good for sight lines from within Canyon Glen and other parts of Steiner Ranch. Access: The plan is to create a new road to service the apartment development that will run just south of the Welcome Center (i.e., through the parking lot that currently services that retail center) and a traffic light would need to be added at that intersection. *** UPDATED May 2012 *** A second exit from the access road would be constructed exiting into Canyon Glen – the second exit is needed for fire access. After concerns were raised by SRNA on behalf of Canyon Glen residents, Taylor Morrison has agreed to make this access gated to prevent apartment traffic from utilizing the neighborhood for cut-through traffic. Further during discussions, the developer suggested making the gate electronic to still allow for Canyon Glen residents to have access through the road into Vista Ridge – providing them access to the new signal light – this would provide a net advantage to Canyon Glen residents. Taylor Morrision has re-submitted its development application in Nov 2013 and plans to start development in mid-2014. Taylor Morrison and KLP/Kucera would like develop this tract as 3-4 bedroom duplexes. Push back from Travis County TNR which agrees with SRNA that the site is not a good fit for residential development means that a variance should be needed to allow for development with a single exit per the current plan: two exits are required for more than 30 homes/duplexes. SRNA would not support such a variance (see MU-14 Residential for more details). The new application has been filed by Armbrust and Brown LLP law firm and again petitions for the approval – the developer will be seeking approval and also has a potential alternative of constructing an additional exit from the site. SRNA has repeatedly petitioned for alternative options for Mu-14 including consideration of allowing residents to purchase the tract via the WCID 17 which could be approved by an election. This tract would allow for commercial development, but this would require waiting with the land on the market for a suitable buyer. These condo lots are intended to have a single-family feel similar to the Fairways near the Golf Club. These are currently being developed by Taylor Morrison with 60-foot lot homes similar to Mediterra and will have views of Lake Travis and the greenbelt – availability in mid-late 2014. This project has a site development plan approved and construction began earlier this year This property is directly behind some residences at the Summit at Eastridge. SRNA has discussed initial concerns voiced by some residents with Taylor Morrison and they have agreed that individual home owners may convey particular concerns with views or lines of sight that may result for example in selection of one story vs. two-story homes if it makes a difference for a significant view; e.g. such as a lake view. Gehan homes purchased this tract during 2012 and is aggressively building mid-large sized spec homes in this area with canyon and lake views. At the UT Golf club – Taylor Morrison has developed 10 two two-story buildings with an upper and lower unit each being between 2,500 and 3,500 SF. ; UT purchased part of this tract for their Tennis Center; Golf Club purchased part of this tract to build a pool and additional parking. Due to the small size and challenging topography of this tract, as well as the developer’s lack of remaining impervious cover credits, it’s anticipated that this tract will not be developed. This property is located off of Selma Hughes Park Rd. and Quinlan Park Dr. and borders Lake Austin. It will be devleoped in four phases, with the 2nd phase being the largest and most dense at 84 units with moderate lot sizes. The reamining home sites will be for custom building and will have a large footprint (>1 acre).